David and I have been talking about taking a vacation this year with Charlie. So since it has always been my dream to go away for Christmas. I think this might be the year to do it as Charlies birthday is December 16th so it would be the perfect way to spend his 10th birthday. As well as allow us to visit places we have never been. As well as visit some of the areas Suzzane was able to attend with my sister and her family right before she passed away. I would like to invite you to check out all the events below and let me know which one you most would want to check out and why you picked it. If you have been to any of these events what did you think about them and was there anything we need to know before we head to them? For fall, Silver Dollar City presents the National Crafts & Cowboy Festival, featuring some of the nation’s finest craftsmen and authentic cowboys. The festival offers a Wild West Show with trick riders, ropers and a world-champion Native American Hoop dancer; Western music; a barn dance, and 125 visiting artisans. Best of Missouri Hands juried artists demonstrate their art and fall harvest foods served up September 13 – October 28 at the Branson, Missouri theme park. Over 125 visiting craftsmen from around the country display their art, including Best of Missouri Hands juried artists, all joining Silver Dollar City’s 100 demonstrating craftsmen. Silver Dollar City’s Wild West Show features trick riders, Native American dance with 8-time World Champion Native American Hoop Dancer Nakotah LaRance, comedy canines, and trick roper and bullwhip artist A.J. Silver. Legendary Western actor and watercolor artist Buck Taylor hosts “Buck Taylor’s Cowboy Emporium,” featuring a variety of Western crafts. Plus Chuck Wagon & Food Network Chef Kent Rollins and Extreme Mustangs are featured in the Red Gold courtyard. A Western Barn Dance presents a kick-up-your-heels fun, with a live band. They have Western music with groups including The Malpass Brothers, The Home Rangers, Belinda Gail and Kristyn Harris, 2016 Western Music Association Entertainer of the Year. NEW: The nation’s pioneer culinary heritage comes to life with campfire cooking and cowboy cuisine, including Cowboy Beef Stew and Dutch Oven Desserts. This event draws approximately 300,000 visitors each year. Festival history: Silver Dollar City began the fall crafts festival tradition in 1963, bringing in visiting artisans in addition to the park’s growing resident crafts colony, with the goal of showcasing the makers along with the finished artwork. More than half a century later, a unique feature still is that all visiting crafters, as with the park’s owner, demonstrate their work, so guests see the process, the skill and the creativity of true craftsmanship. 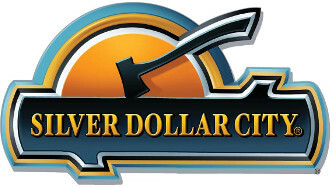 Silver Dollar City became the nation’s largest festival of demonstrating craftsmen. The focus on authentic craftsmanship was one of the reasons the U.S. Congress in 2010 proclaimedSilver Dollar City the “Home of American Craftsmanship.” In addition to artisans, Silver Dollar City added features with another American icon several years ago, the cowboy, to carry on the festival as The National Crafts & Cowboy Festival. NEW: Christmas in Midtown, a 70,000 sq. Ft. a city filled with new light displays nine stories high, including 30 angels, animated reindeer pulling a sleigh, three light tunnels, two 40-foot long moving trains, dozens of stars and snowflakes, and a 50-foot tree, all created at Silver Dollar City. Christmas in Midtown, the most substantial single lighting expansion to date in the past two decades of the festival, adds 1.5 million new lights, bringing the park’s total to 6.5 million views! Rudolph’s Holly Jolly Christmas Light Parade, led by the most famous reindeer of all, features lighted musical floats with 200,000 lights accompanied by 33 costumed characters. Rudolph’s Christmas Town, where kids can meet Rudolph, Clarice and Bumble, also includes activities from Reindeer Games to cookie decorating. Two original musical productions present Broadway-style experiences, with elaborate sets and talented casts: It’s a Wonderful Life, adapted from the Frank Capra classic, and the acclaimed production A Dickens’ Christmas Carol. The Christmas on Main Street light & sound show features the 5-Story Special Effects Christmas Tree with over 350,000 colorful LED lights. Tinker Junior’s Toy Shop is an interactive show for kids featuring a 12-foot talking and singing Christmas tree. Kids can meet Santa in Santa Claus Lane, illuminated by colorful lights. The festival presents holiday shows, a musical Living Nativity, shows, rides, shopping and new Silver Dollar City dining specialties. Post on behalf of US Family Guide and Silver Dollar City – National Crafts & Cowboy Festival and we will be receiving tickets to attend these events, but the thoughts in the review will be all mine and my families. Once again when we don’t ask Pray about the things we want to do sometimes something happens and we can’t move forard which is what happened with taking Charlie on a Vacation and being able to attend this new event. But one thing I have learned is when something doesn’t happen when we think it should it doesn’t mean it will not happen it just means then wasn’t the right time. So as we proceed it’s Summer again and I am not making plans this year I am just going with the flow and if this event happens in the Future and it is God’s will then I would like to attend as it would make a nice addition to our Homeschool Lesson Plans as well as a fun and unique vacation. Although if it doesn’t happen I am ok with that as well as I know it wasn’t Gods will and I will just move forward because I know one day my family will be able to take a Vacation together even if its after Charlie is grown.